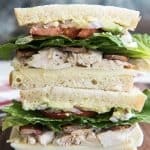 This Turkey Bacon Avocado Sandwich is inspired by my favorite bakery & cafe in Utah. Kneaders makes the most amazing food, and this sandwich is my go-to item on their menu, especially with their mustard-mayo that gets slathered on the bread! Combine all sauce ingredients together in a small bowl and stir well. Refrigerate until ready to use. Assemble each sandwich by spreading Kneaders sauce on each bottom slice of bread, then topping with provolone cheese, followed by turkey, bacon, lettuce, tomato, onion, avocado, salt & pepper, and the remaining top slice of bread, also spread with Kneaders sauce.